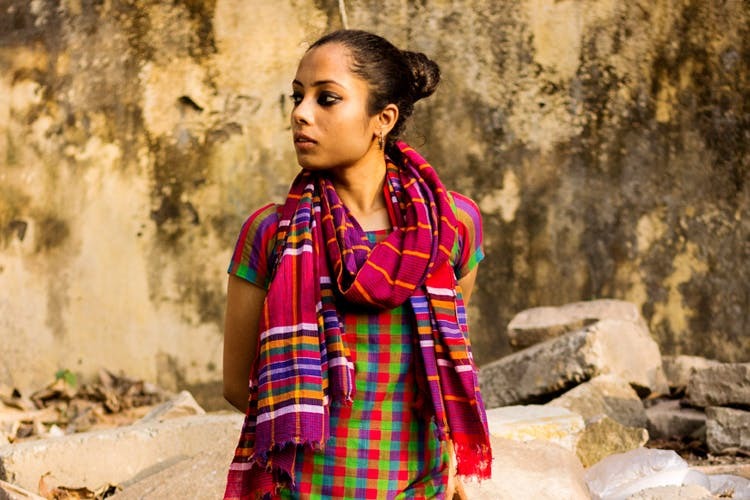 Tri is an upcoming Kolkata based brand that features dresses, hair accessories, notebooks and scarves handcrafted completely out of Bangladeshi gamcha for anyone looking to spice up their wardrobes this season. A simple scarf gift to a friend which snowballed into a small brand, Tri became a reality when it launched on Facebook in 2016 by Tri Paul. Gamcha is a coarse cloth generally used as a towel, or cleaning the floors. Tri has innovatively converted the same cloth into fashion apparel and more. Everything is custom-made by local tailors, and made to order. It’s affordable, hand-made and eye catching. Tri is minimalist and fashionable all rolled into one. Ordinary and otherwise dejected plain gamcha is turned into beautiful Bong style blouses, kaftan dresses, hair accessories and even kamar bandhs to wear and flaunt. Colours are sober, with hues of pastels and prints are generally checked. Our favourite picks are the gorgeous gamcha cover notebooks, and the breezy blue kaftan dress. We advise you to call Tri for placing orders, as she is open to shipping pan-India. There’s a standard delivery charge depending on the city.